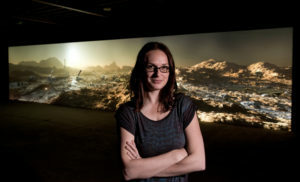 Internationally acclaimed artist and new Visual Arts professor Kelly Richardson will be one of five digital media artists featured in the upcoming XL-Outer Worlds large-format film project, which will be shooting at Port Renfrew’s Avatar Grove / T’l’oqwxwat in summer 2018 and released on IMAX screens across Canada in 2019. 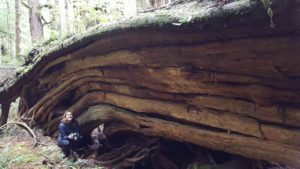 The Ontario-born artist has been living in the UK since 2003, and teaching at Newcastle University since 2013, but decided to move to Vancouver Island specifically upon seeing BC’s old-growth forests first-hand during her time as a UVic Visiting Artist in the fall of 2016. Hear more about the project in Richardson’s January 9 interview with CHEK TV. The story was also reported in the January 10 edition of the Sooke News Mirror, the January 11 Canadian Art news roundup, the January 13 issue of the Saanich News, a large spread in the January 14 Times Colonist, the January 16 broadcast of CBC Radio’s On The Island (no link available), the January 17 edition of the Peninsula News Review and the news section of Galleries West magazine. 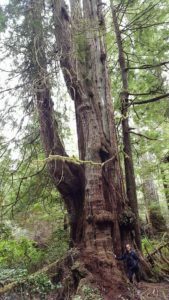 Vancouver Island’s old-growth forests have a long history of artistic representation, whether as the medium and inspiration for centuries of Indigenous works or the iconic paintings of Emily Carr. Known for creating hyper-real digital films of rich and complex landscapes manipulated using CGI, animation and sound, Richardson’s work fuses 19th century painting, 20th century cinema and 21st century scientific inquiries, Richardson creates works with strong environmental themes, asking viewers to consider what the future might look like if we continue on our current trajectory of global environmental crisis. The XL-Outer Worlds project celebrates the 50th anniversary of the IMAX, a Canadian invention, and Richardson’s film will be shot by Christian Kroitor, the grandson of IMAX inventor Roman Kroitor. Featuring four other Canadian media artists (Michael Snow, Oliver Husain, Lisa Jackson, and Leila Sujir), the commission focuses on short films creating a larger-than-life landscape that forms an outer world. Highly in-demand as an artist, in 2017 Richardson was involved in 14 solo and group exhibitions across Canada and in China, France, the UK and the US. Her works have been widely acclaimed in North America, Asia and Europe, and have been acquired by the National Gallery of Canada, Art Gallery of Ontario, and Musée d’art contemporain de Montréal, as well as by museums around the world. 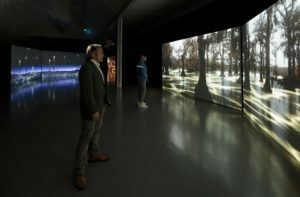 Her video installations have been included in the Toronto International Film Festival, Sundance Film Festival and she was previously honoured at the Americans for the Arts National Arts Awards alongside Robert Redford, Salman Rushdie and fellow artist, Ed Ruscha. Richardson’s old-growth project will be created with the participation of the Ancient Forest Alliance (AFA) who, together with the Port Renfrew Chamber of Commerce, spearheaded the protection of Avatar Grove — called T’l’oqwxwat by the local Pacheedaht First Nation — which is home to one of the most spectacular and easily accessible stands of monumental old-growth trees in BC. The campaign to protect Avatar grove, spearheaded by the AFA and the Port Renfrew Chamber of Commerce — a ground-breaking alliance of environmental activists and the local business community — has significantly fueled a provincial movement of businesses, labour unions, city and town councils, and environmental groups calling on the British Columbian provincial government to protect old-growth forests and to ensure a sustainable, second-growth forest industry.